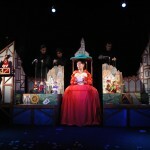 Slovakia boasts several national and international festivals of puppet theatre. Bystrica Puppeteers’ Festival is the oldest puppet festival in Slovakia. The festival came to life in 1977 as an initiative of Jozef Mokos in the form of a national meeting for Slovak professional puppet theatres. Since its inception the festival has been held in Banská Bystrica. In the time after the Velvet Revolution, in 1992, the Ministry of Culture organised a competition to devise a new festival concept and it became international in scope. 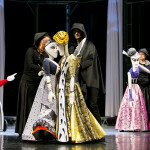 Its organisers were then the Slovak Centre of the ITI, the Association of Slovak Theatre Professionals and Puppet Theatre at the Crossroads in Banská Bystrica. The director of the Festival was Ida Hledikova, a technical assistant of the Slovak Centre of the ITI. Since 1994 Puppet Theatre at the Crossroads has been the exclusive organiser of the Festival. 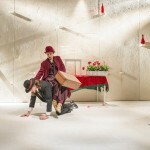 In the meantime the Festival has been reprofiled into a regional festival of the V4 (Visegrad) countries in which theatres from the Czech Republic, Hungary, Poland and Slovakia regularly present their creations. It is an international festival of puppet theatre for children and adult audiences today. The festival also hosts exhibitions and in recent years the Henryk Jurkowski Prize (internationally known Polish theorist and historian of puppet theatre) has been awarded here as well. The director of the Festival is Iveta Skripkova. The organiser of the Festival is the Puppet Theatre at the Crossroads and its Director is Iveta Skripkova. The festival is held every two years. The Festival of Theatres and Theatre Schools of the V4 Countries was founded in 1999 by the Old Theatre Nitra (since 2009 known as Karol Spišák Old Theatre in Nitra) as a spontaneous event entitled Festival of Theatres and Theatre Schools of the V4 Countries. The first two years of the Festival were a period of searching for the appropriate concept. The motto of its third year comprised the following attributes: Certainties, Possibilities and Expectations. These became the premise for the definition of the festival programme which provided space to both traditional and experimental puppet theatre and also offered the possibilities of creative dialogue and exchange between higher schools of puppet theatre. Known in the four languages as Stretnutie ─ Talakozas ─ Spotkanie ─ Setkání (‘Meeting’), this non-competitive festival features presentations by higher schools of puppet theatre from the Czech Republic, Hungary, Poland and Slovakia. The organiser of the festival is the Karol Spišák Old Theatre in Nitra. It is held annually in May or June. Established in June 2008 by the Žilina Puppet Theatre, the Žilina Puppet Festival is one of the newest puppet festivals in the Slovak Republic. It was founded in response to the need to offer a forum for the presentation of creativity by the Slovak puppet theatres now that the festival in Banská Bystrica has evolved into an international festival. The festival aims to survey the work of the national ensembles and is not competitive. The Hašterica Award, which honours the best accomplishment attained in the Slovak puppet theatre over the previous two years, is given at this Festival. The organisers of this competition are the Slovak UNIMA Centre, the Rázcestie Civil Association and the Žilina Puppet Theatre. The organiser of the festival is the Žilina Puppet Theatre, the Director is Peter Tabacek. The Festival is held every two years. The Virvar Festival, organised by the Puppet Theatre in Košice, is a young international festival of puppet productions. The addressees of the Festival are families with children. The Festival is held in the hall of the Puppet Theatre in Košice and in the streets of the city. Conferences on puppet theatre create one part of the Festival. In 2013 the theatre together with the UNIMA Research Commission (UNESCO) organised a major theatrological conference Puppet Transformations 1 with participants from Asian countries, Europe and Latin America. The Puppet Theatre in Košice develops publications activities in this field as well. A number of other short or occasional festivals are also held in Slovakia such as the Variant Festival of the Modern Puppet Art in Bratislava (last held in 2000) and Minifest Top in Topoľčianky (1994, 1996, 1998). The late Anton Anderle also staged a one-off festival of Anton Anderle in Banská Bystrica (1999). The We Play for You Festival, the presentation of puppet theatres for children, organised by Bibiana: International Art House for Children, has ceased to exist. Slovak and Czech Puppetry have been nominated for the Representative of the UNESCO List of the Intangible Cultural Heritage of Humanity.